Changes in Relative Strength Index (RSI) have low correlation with changes in price for timeframes longer than two days. This relationship is highly robust for four major ETFs. 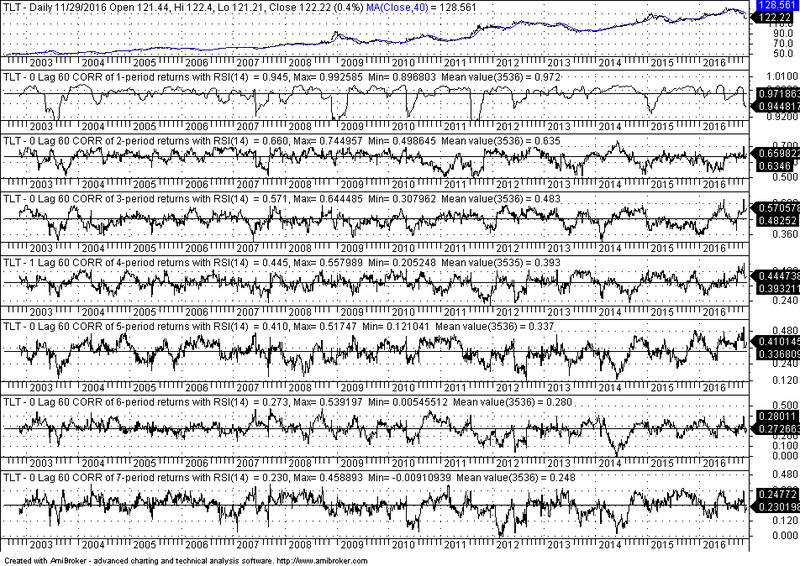 The conclusion is that only very short-term traders should look at the RSI. 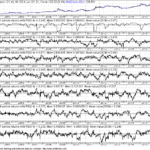 Position traders, trend-followers and longer-term investors should not pay attention to RSI indicator. This indicator has some limited value only for very short-term traders and speculators. 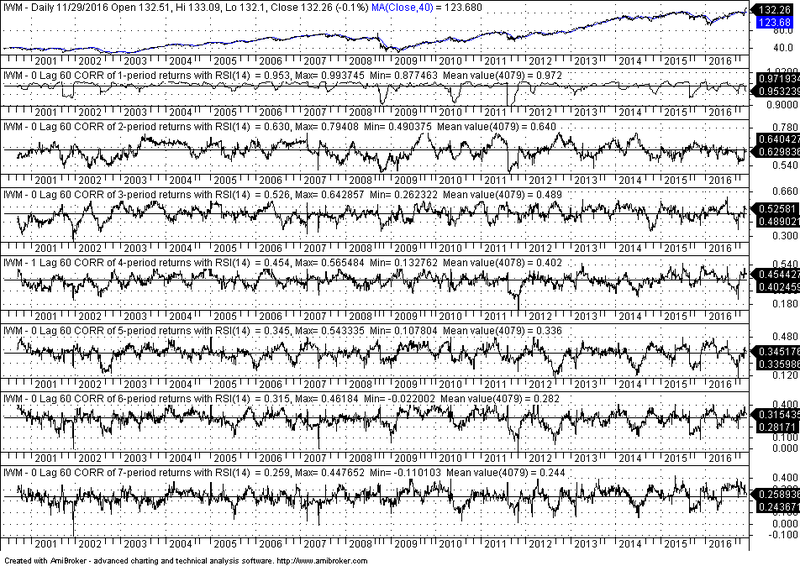 Actually, since the RSI is a short-term momentum indicator, its use for overbought and oversold indicator makes sense in the context of gambler’s fallacy. Specifically, short-term traders expect a reversal in prices when the RSI indicator, usually calculated over a period of 14 days, moves above 70 or below 30. This works at times but it only takes one or two days of a reversal to work off overbought/oversold conditions. 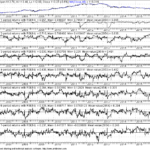 Therefore, use of the RSI indicator makes sense only in the case of short-term speculators. 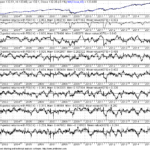 It may be seen from the above table that there are minor deviations in the correlations for the four major ETFs and mostly in higher timeframes. Again, the pattern of minimum correlations is robust and reveals the important result that RSI changes are little correlated to price changes after the second day and the correlation vanishes after the fourth day to become negative after the sixth day. Oversold/overbought conditions, in the gambler’s fallacy sense of a reversal, are valid only for one day into the future and after that memory decays fast. 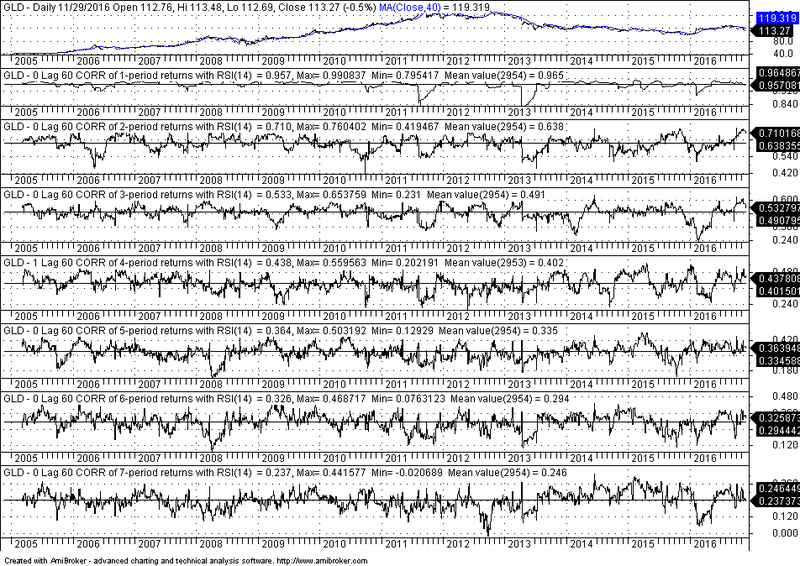 Therefore, the RSI indicator has some value only for very short-term speculation with a maximum timeframe of two days. Beyond that, the indicator loses its memory of price changes. 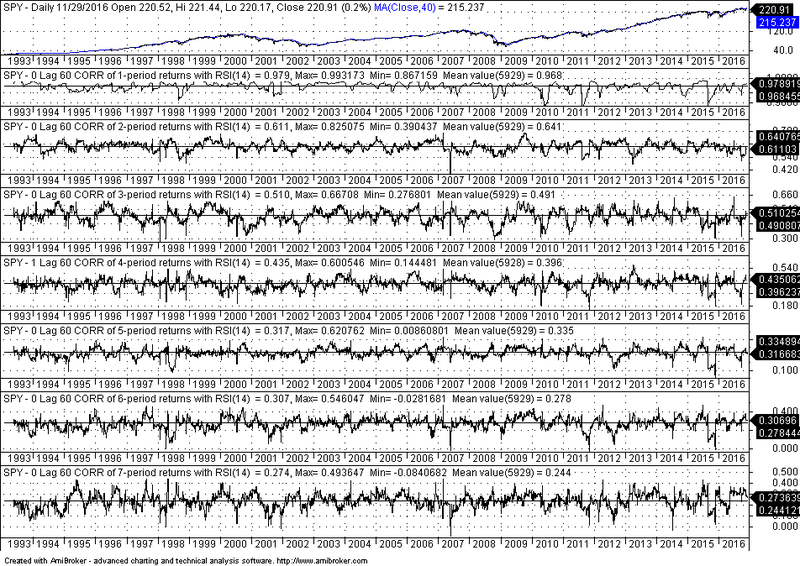 It may be seen from the above chart that the correlation of RSI(2) to first differences in price (1-d) is 0.80. As the timeframe increases, the correlation drops faster. 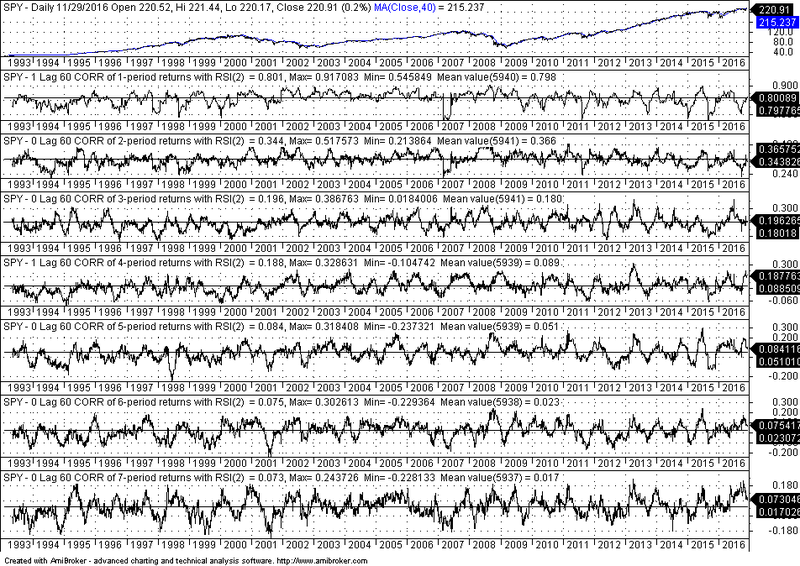 Basically, the RSI(2) loses its correlation to price differences after one day. The conclusion is that the RSI indicator is a very short-term indicator and position, medium-term and especially longer-term traders should ignore it and especially discount any hype in financial media based on overbought/oversold conditions.